More than 93 million Americans suffered from obesity last year according to the Center for Disease Control and Prevention. Obesity isn’t the feeling that your jeans are a little too snug. Obesity is serious and can lead to conditions including heart disease, stroke, Type 2 diabetes and even some cancers. Fortunately for Thurston County residents, we have a specialist in Bariatric Surgery right here at Capital Medical Center in Olympia. Dr. Monica Young arrived in Olympia in January of 2018. A Portland native, Young was excited to be back in the Pacific Northwest after completing a comprehensive education throughout the United States. 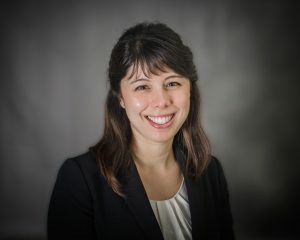 She began at the University of Notre Dame for undergraduate school and medical school at the Indiana University School of Medicine before heading southwest to the University of California – Irvine for her Residency in General Surgery. Finally, Young completed her fellowship in Minimally Invasive Gastrointestinal and Bariatric Surgery at the University of Washington. Young knew that she wanted to be a surgeon early on in her career. “I loved anatomy and working with my hands,” she shares. As a child, she played piano and tennis, and enjoyed problem-solving. “Surgery provides me with the opportunity to physically fix something and see results and a positive change for my patients,” she adds. There is no greater satisfaction for Young than seeing a patient who has struggled with the effects of obesity gain their lives and health back after bariatric surgery. The two main operations performed for weight loss in the United States include the laparoscopic roux-en-Y gastric bypass and the laparoscopic sleeve gastrectomy. Both work by restricting food intake and changing hormone release related to appetite and blood sugar control. These procedures can help patients lose up to 70 percent of their excess body weight. “Bariatric surgery can not only cure medical conditions such as diabetes, high blood pressure and sleep apnea, but also truly improving a patient’s quality of life” explains Young. 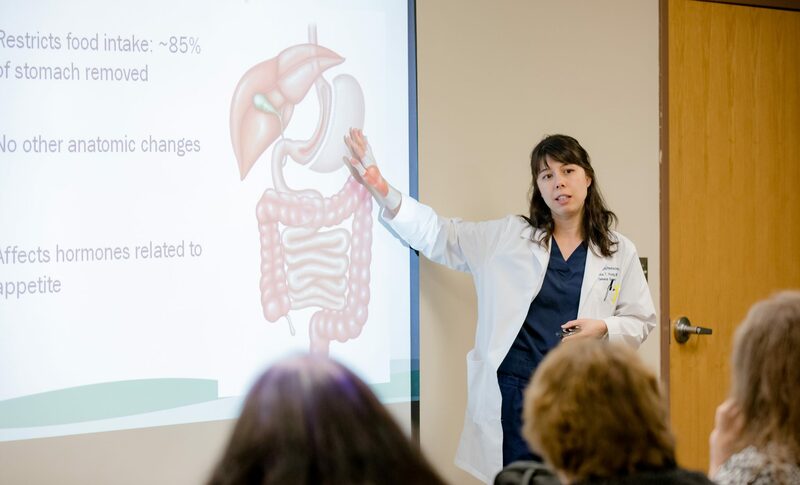 The Bariatric program at Capital Medical Center begins with a free informational seminar. All are welcome and encouraged to attend the seminar which takes place on the third Thursday of every month from 5 p.m. – 6 p.m. at Capital. Patients and their families are invited to meet Young along with the Bariatric Coordinator, Debra Kiely. Kiely is a Registered Nurse who assists Young in running the program and ensuring patients have all the information they need to make a decision regarding bariatric surgery. “The first step is to attend the free seminar and have all their questions answered,” explains Kiely. “We do a complete evaluation to determine if this is the right course of action.” Kiely is resource for those exploring surgery as well as people who have already undergone a procedure. “We discuss everything from nutrition, diet and exercise to recovery with our patients,” she adds. The Bariatric Program at Capital is the only program of its kind in the South Sound. The closest program is some-30 miles north, and Young is finding the program to be a welcome addition to the area. “When I was doing my fellowship at the University of Washington, I had many patients who were traveling up from Olympia and surrounding areas … I knew that this program was greatly needed in the South Sound, and we are thrilled to be able to bring this specialty surgical service to the community,” Young states. The response to the program has been great, and enrollees have steadily increased throughout the year. If you are sitting on the sidelines due to obesity, this may be the answer for you. 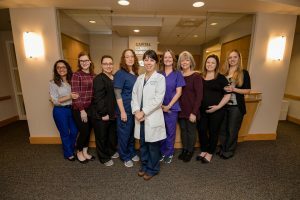 The multidisciplinary bariatric team includes a surgeon, registered nurse, dedicated dietician, medical assistant and clinical psychologist. Everyone is dedicated to helping those who have been evaluated as good candidates go through the process of weight loss surgery. And the support does not stop after the operation. A post-surgery support group meets with Kiely on the fourth Wednesday of every month. Patients can ask questions and enjoy the community of others who are going through the same experience. For more information on the Bariatric Program, visit the Capital Medical Center website.